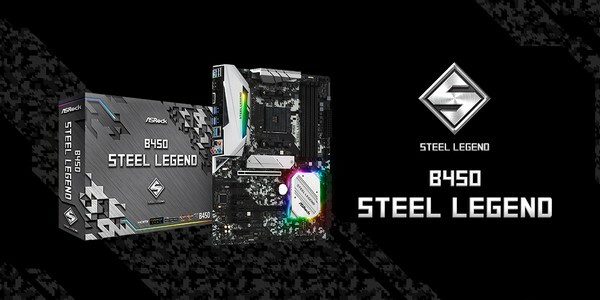 ASRock B450 Steel Legend and B450M Steel Legend motherboards introduced. The leading global motherboard manufacturer, ASRock, is proud to introduce the new ASRock Steel Legend motherboard series. ASRock Steel Legend motherboards are built around the most demanding specs and features to provide a wide array of materials, components, and features that ensure stable and reliable performance. Steel Legend motherboards stand out from the crowd through its massive and luscious XXL Aluminum Alloy Heatsinks, I/O Armor, PCI-E Steel Slot, Polychrome Sync Addressable RGB LED support, and detailed PCB print on Sapphire Black PCB for mainstream users, gamers, and professionals that choose to work and play in style. With support for the latest AMD Ryzen processors, as well as high-quality audio featuring the highest quality Nichicon golden audio caps and signal shielding integrated into the PCB. The ASRock B450 Steel Legend is a full-featured ATX motherboard for first and second generation AMD Ryzen processors with Radeon VEGA graphics for socket AM4. This Micro ATX version packs the same punch as its big brother, in a size optimized for space-constrained builds. Because of the focus on size, the ASRock B450M Steel Legend features dual M.2 sockets that offer flexibility for DIY users.